You all know I’m a sucker for all things Vintage, so imagine the squeals of excitement I let out when the lovely people over at MyBag.com sent me some information about their amazing range of Vintage classics that launched on their site today! The Vintage Collection is made up of some of the most iconic designer handbags that have been sourced especially for the site. 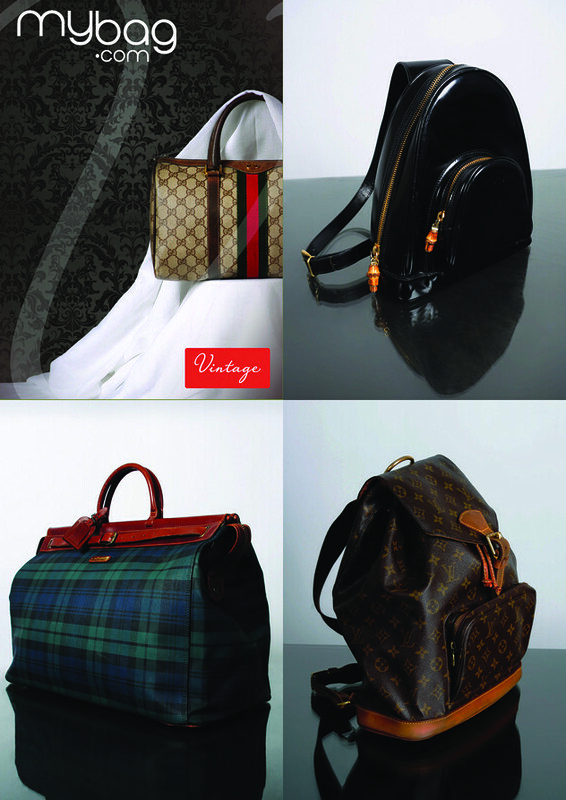 There are Vintage bags from design houses such as Chanel, Gucci and Louis Vuitton to name only a few. ICONIC – The Iconic collection takes an 80s feel from classic Chanel and Gucci, and brings the effortless style of polished fashion icons from Jackie O to present day Diane Kruger. The classic Vintage quilted shoulder bag from Chanel is a timeless treasure, encapsulating the style and history of one of the most desirable brands in the world. 80S MONOGRAM – Transport yourself back to the decade of power dressing and affluence. With over the shoulder styles back on trend, make a statement with the Vintage Leather Trim Monogram bag from Pierre Cardin or the Signature Embroidered Monogram bag from Gucci. CLASSIC VINTAGE – The Classic Vintage collection features beautifully aged luxury leather and styles which remain contemporary. Complete with style icons from Anna Wintour to Nicole Ritchie with the timeless Vintage Mini Leather Satchel from French fashion house Celine or the statement Vintage Shoulder Bag from iconic brand Louis Vuitton. 70S STYLE GRAB BAGS – With the classic paisley print of the Etro Leather Tote bag and the soft, luxurious leather and stitch detailing of the Marr Tie Detail Grab bag, this collection embraces the bold, bright and summery style of the 1970s. VINTAGE LADY – This collection celebrates our continued love of classic monogram logos and shapes, with pieces from heritage brands including Gucci, Aquascutum and Furla. With beautiful aged leather and suede, these classic pieces will always remain in style. VINTAGE PRINT – With quirky, unique styling, our Vintage Prints collection is full of delightful and feminine prints, including the beautiful butterfly print holdall from Italian designer Portomoro and the Vintage Magic Circus Leather Shoulder bag from Piero Guidi, famous for the individuality and strong personality in each of his designs. GENTLEMAN’S PRESTIGE – Our prestige collection for men includes timeless luxury pieces worth investing in for a lifetime of style. Travel in luxury with the Check Leather Trim Holdall by Polo Ralph Lauren, or the stylish Vintage Portfolio from Trussardi. As you can see there are plenty of styles to choose from in the Vintage Collection, and these are definitely some beautiful investment pieces. If I had the cash I would snap up the Chanel quilted chain bag in a heart beat. Or would I choose the Louis Vuitton Backpack? Or the Il Tucano Doctor’s bag? There’s too much to choose from! Which piece from the Vintage Collection would you most like to own? I love the top right bag but a little too pricey for me!